From Auburn, it is still west on Route 68 and 80 to Interstate 24 north. At the top of Land Between the Lake we try a suggestion from our Passport America app. 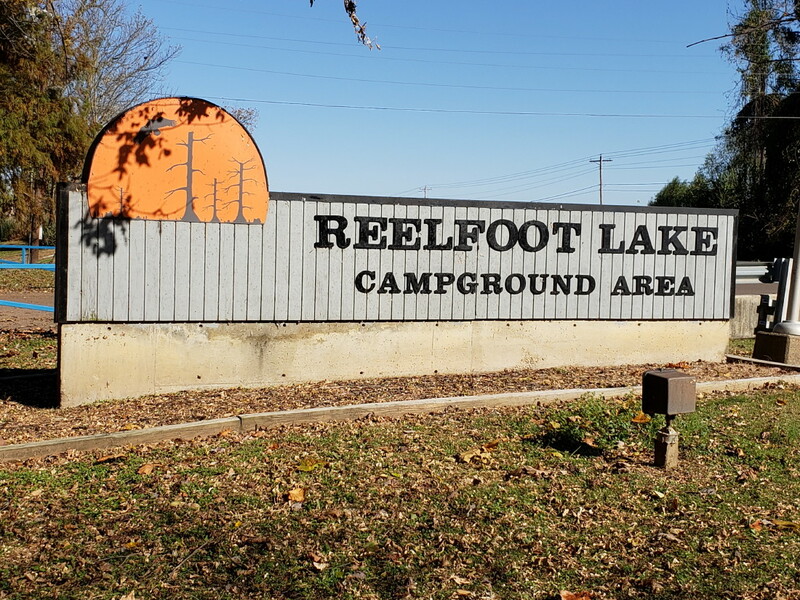 These are half price campgrounds on certain days or certain times of the year. We pay $15.90 for a comfortable stay and continue on the next day. South on Purchase Parkway to Union City and Reelfoot Lake State Park in Tiptonville, Tennessee. Nice views of the water and Bald Cypress trees. For this weekend there are a number of duck hunters that head out in their boats. 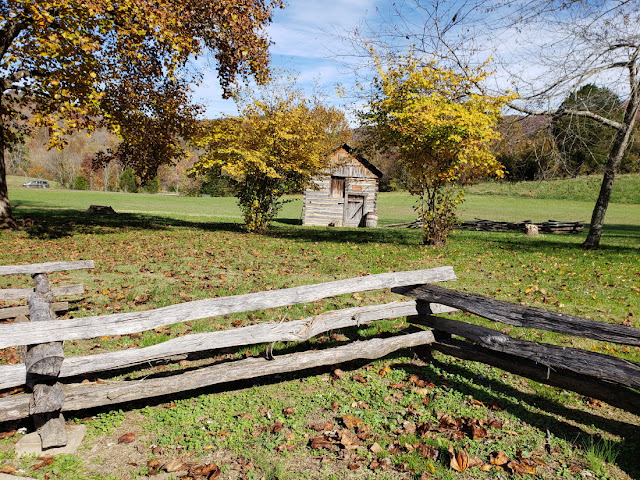 When you get into some of the remote areas of Tennessee and other states, you are following local state roads through farm country and often through the farms themselves. We follow 78 and other local roads south to Interstate 155 west. Along the way are many cotton fields. Some have been harvested and rolled into these enormous yellow bales. Some fields are still waiting to be harvested. Looks like they are covered in snow or covered with popcorn. 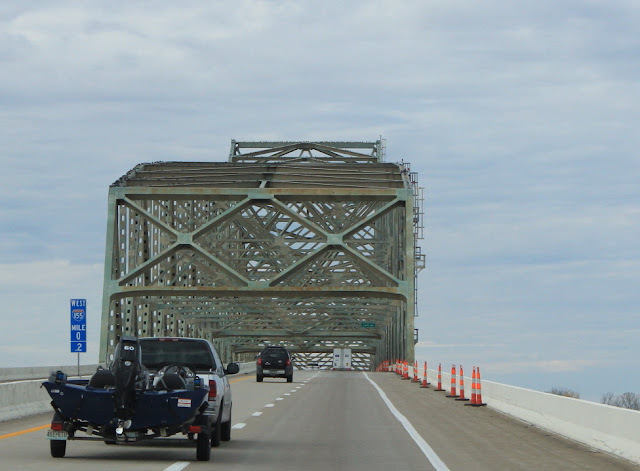 Route 155 takes us across the Mississippi River into Missouri on an older bridge. 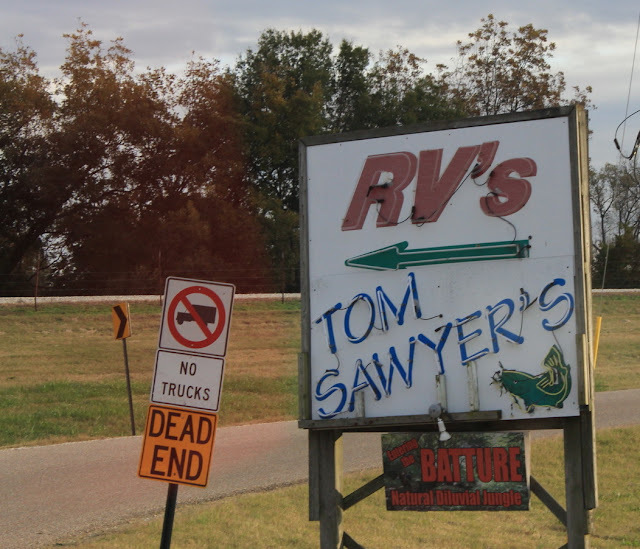 In Missouri, we head south on Interstate 55 to one of our favorite parks, Tom Sawyer , in West Memphis, Arkansas. Can you imagine the first time we saw this sign with our 5th wheel? What do you mean, No Trucks and Dead End? Plus this road takes you over a levee which also seems a little suspect. 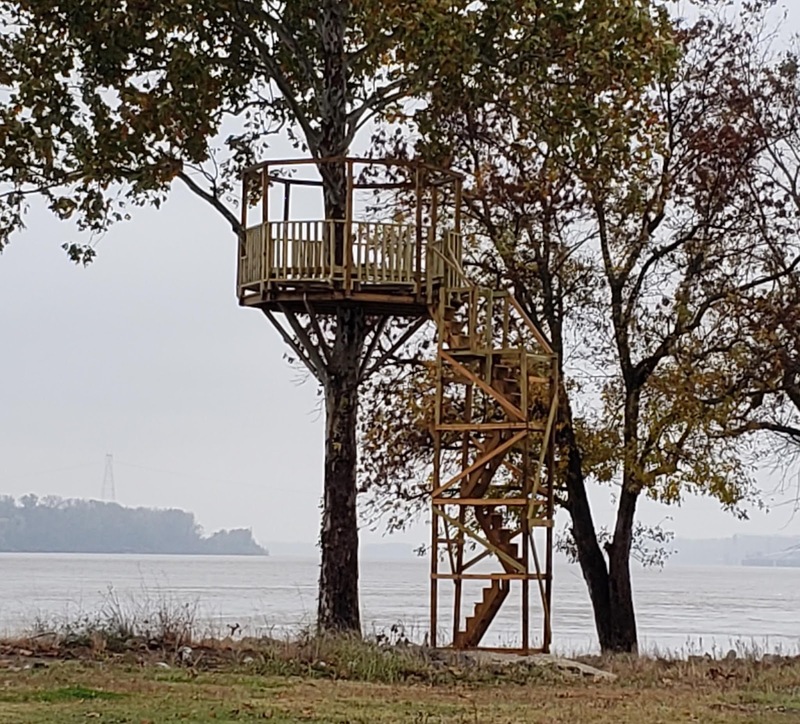 But, even on a cold, rainy day, our site on the riverbank gives us a great view of the barges. This barge pack is made up of six barges long by three barges across for a total of 18 barges. A little brighter weather and the view out our window. This video will give you an idea of the barge passing us and how hard the tugboats have to work to push them upstream. We took that video from right behind Lady Blue. Sometimes we have been here when the river is down 20 feet or so and the barge traffic is limited. Another time we were here and had to leave because the campground was due to flood when the river flooded the next day. This time the river is high, but not near to flooding. They have been working in the park. Besides a number of new sites by the river, there is this new tree platform for your viewing pleasure. The weather in Arkansas was quite cold and the forecast was calling for nights in the 20's and some snow. 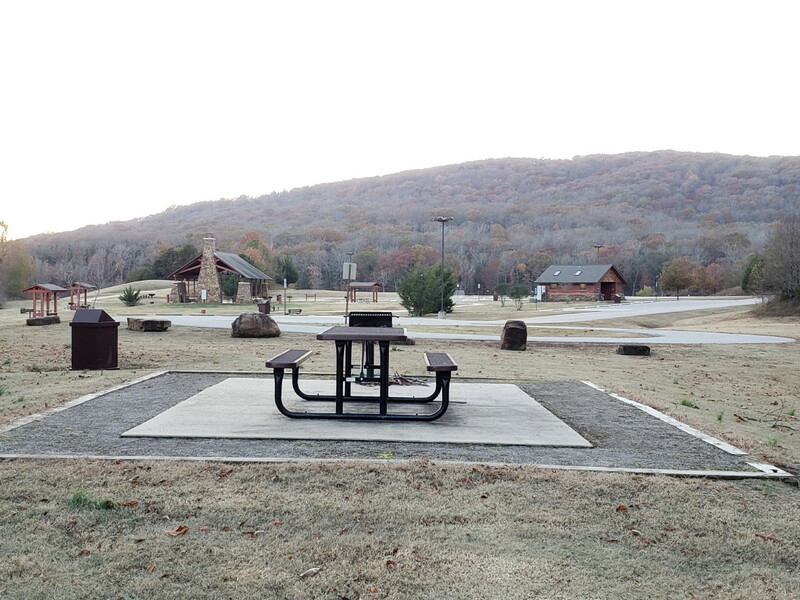 So we drive a number of miles to one of our favorite campgrounds in Russellville, Old Post COE Campground. Getting there, we try a new route up 55 and west on route 64. Following Route 64 to Route 40. A much quieter route. The route was suggested by a wonderful, friendly staff person at the Arkansas Welcome Station on Route 55. A nice historical display at the visitors center by the dam. 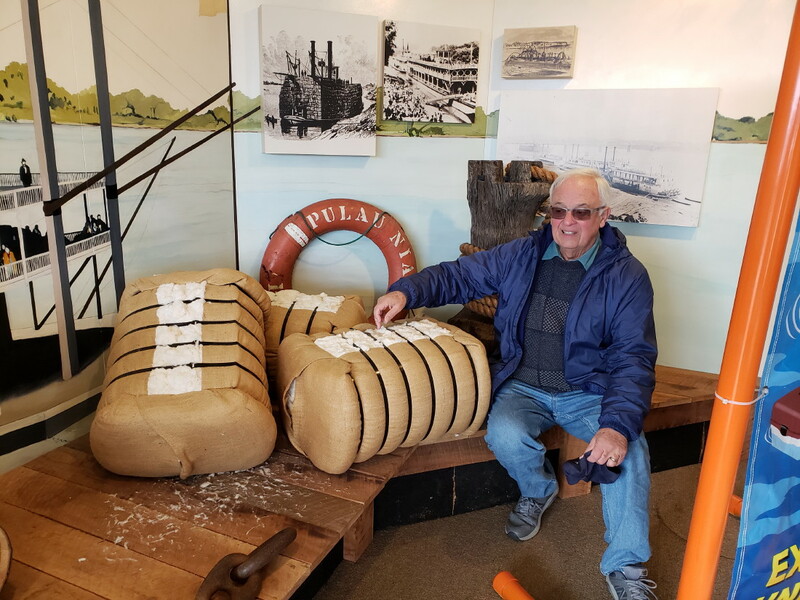 Those are bales of cotton about the size used to pack on the old stern paddle wheel steamers on the Arkansas River. Leave it alone Bruce! That's not what they mean by picking cotton. 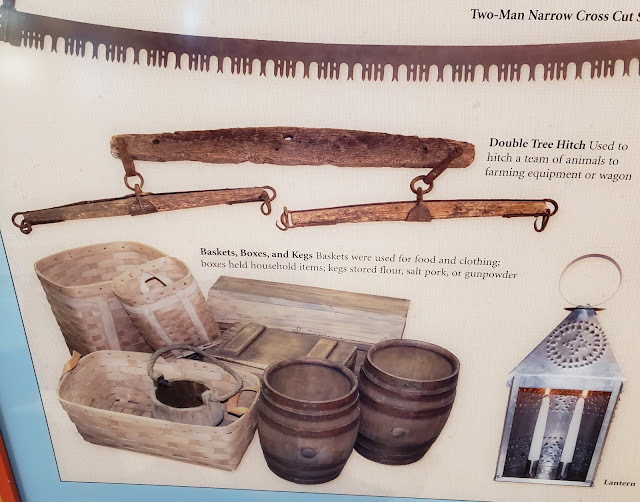 This info display is a little hard to read, but the left icon indicates a barge tow of 15 barges (3 x5), which would carry as much as a 2 and a quarter 100 car trains. Or as much as 870 large semi trucks. 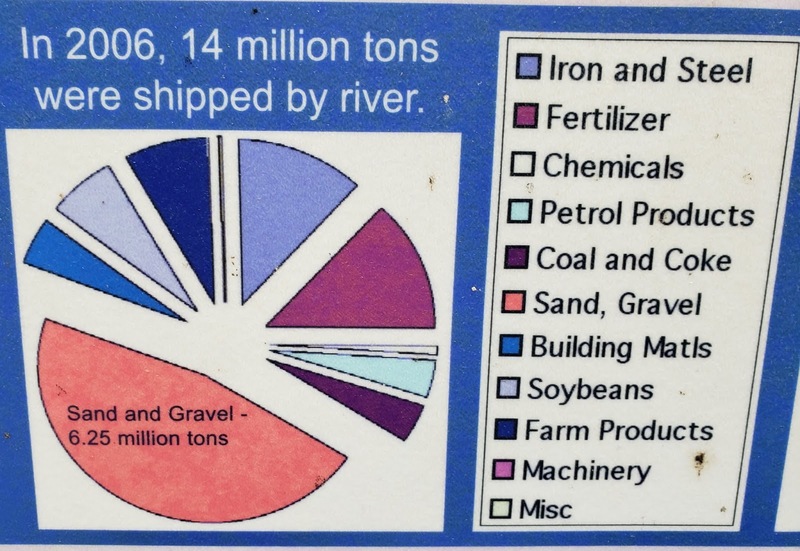 The savings on fuel and lower pollution are huge. Some of the cargo on the barges here on the Arkansas River. 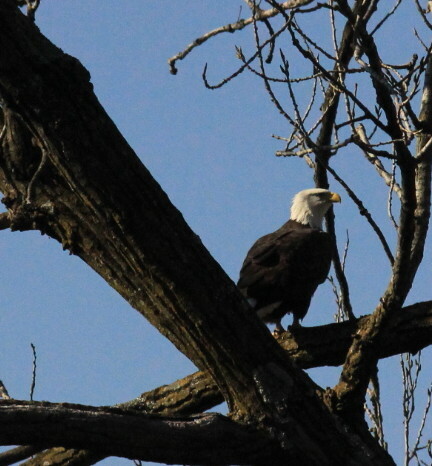 Our neighbor indicated that there were as many as 15 eagles sighted here at the park this year. This is a favorite nesting spot with lots of available fish by the dam. We took this picture behind Lady Blue with the help of our telephoto lens and a little cropping. Our site at Old Post. The Arkansas River is right behind us. 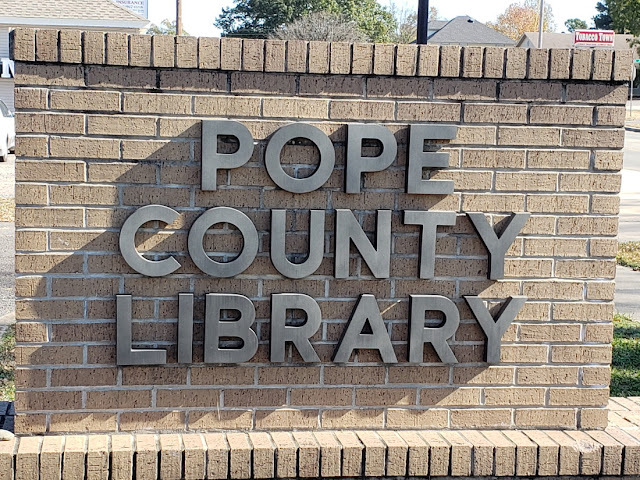 We had to print out some tax papers, so we found a nice staff very helpful at the Pope County Library in Russellville. We enjoyed the name being the same as Jan's maiden name. Printing was easy. 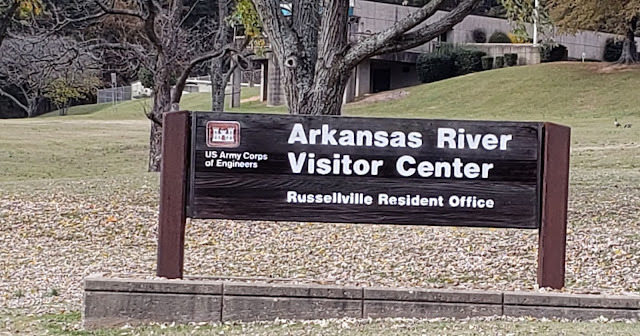 The same camper that mentioned the eagles at Old Post also mentioned he was going on an eagle viewing by boat at the state park in Russellville. Sounded great. We read online that Lake Fort Smith State Park in Mountainburg ,had been renovated recently, so we head there to check it out. The park was closed for a few years while they enlarged the dam to provide more water for locals. In the process the old park went under water and a new one was created. This was opened in 2008. Beautiful!! Above is a display for an early settler log cabin with hand hewn logs and local mud for sealing between. 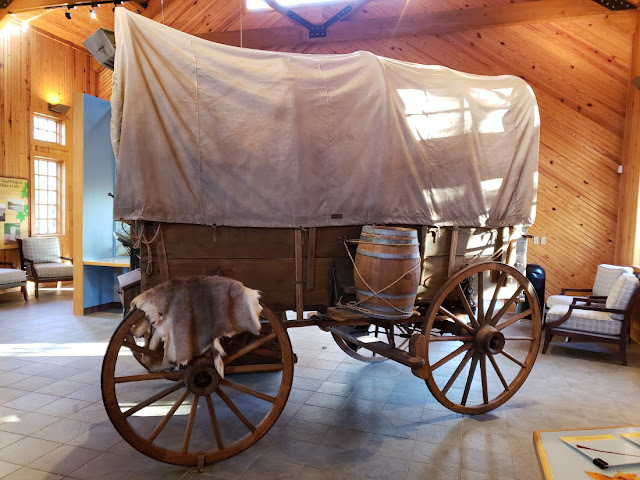 We loved the description of this covered wagon as the "pickup truck" of the early settlers. 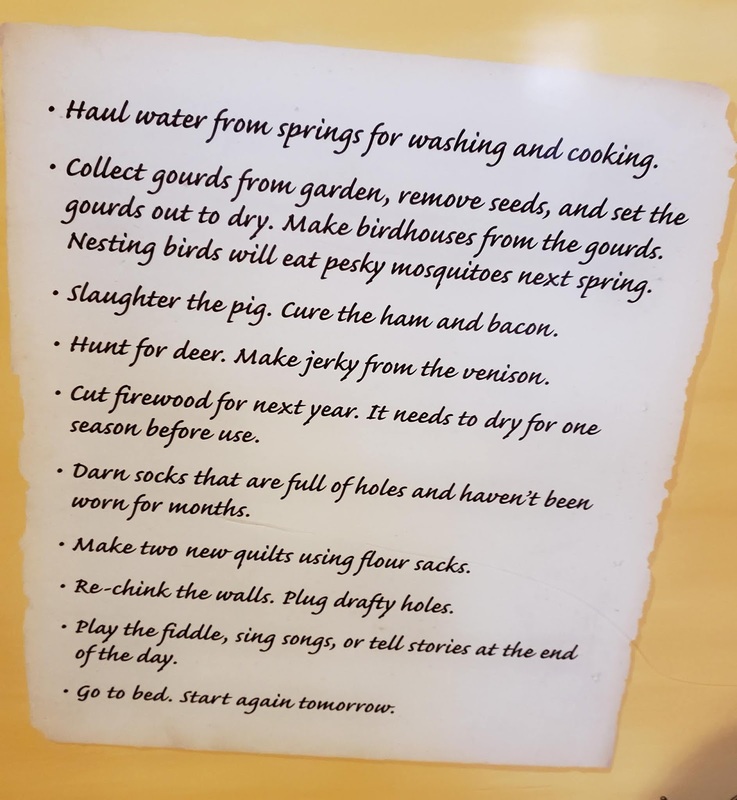 It carried everything they needed to get started with a homestead. No heading down to the Lowe's for supplies though. 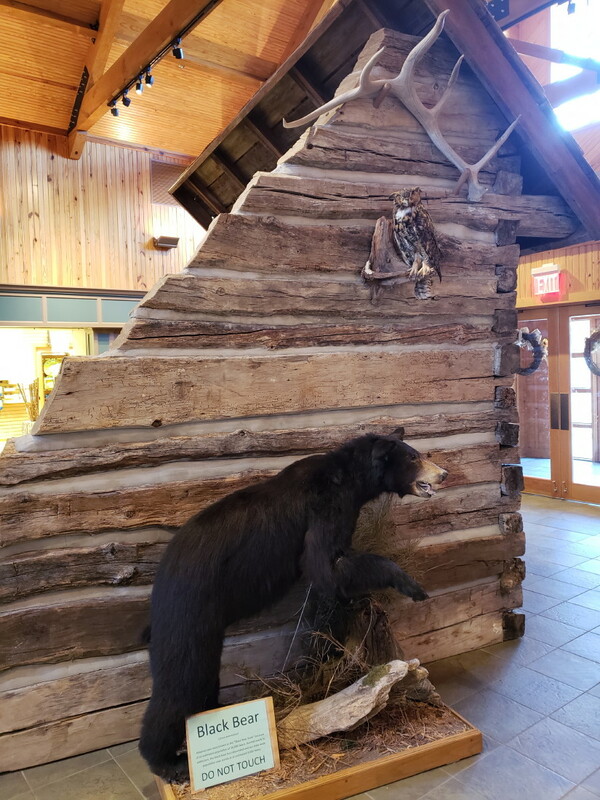 Yes, we still are seeing a number of bear warnings at campgrounds. Just a small list of chores around the homestead. 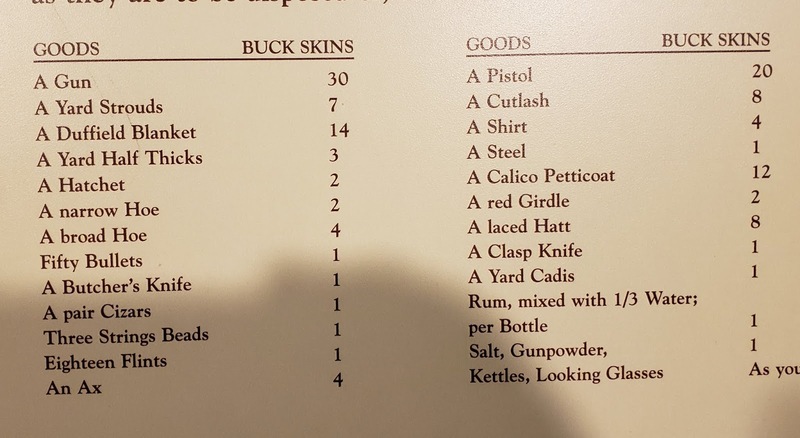 A few of the items needed by every settler. This reminded us of our early days in the late 1940's and early 1950's. 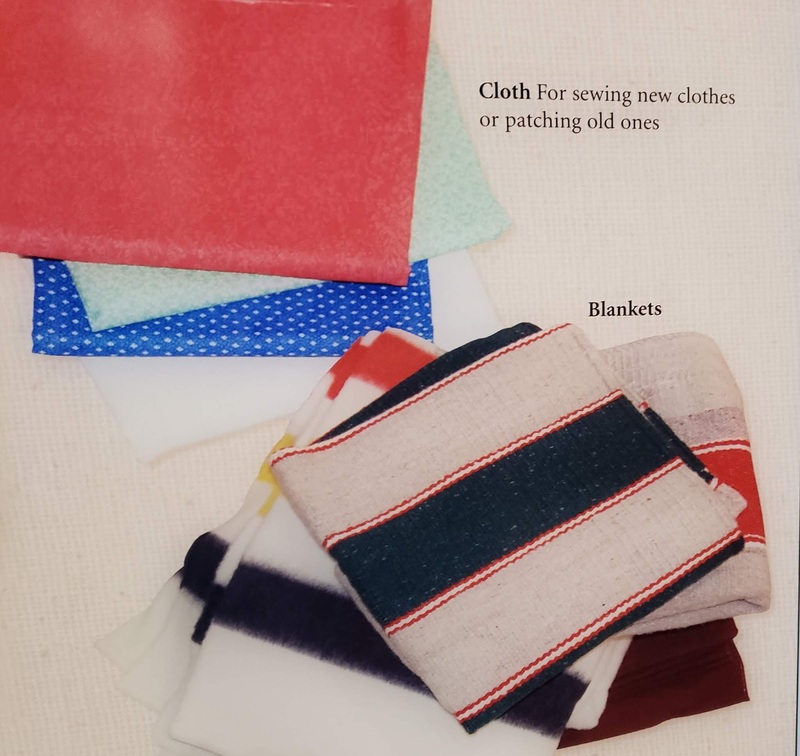 Grandmother Marshall was constantly mending old clothes, socks, and sewing new clothes from dress patterns and more. Sound familiar? Things we don't think about. Storage containers, lamps, saws, and items needed for the work animals. This is one item that has made a comeback. 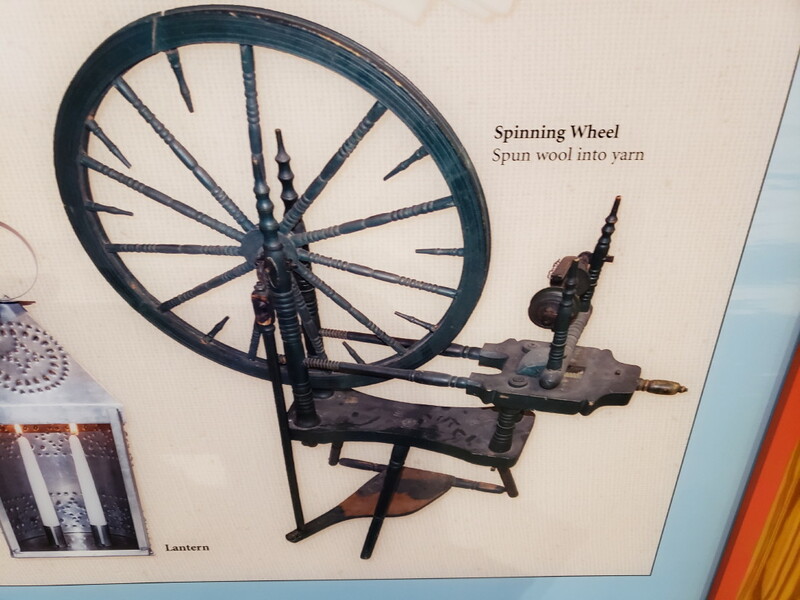 There are many groups across the country that are promoting spinning wheels and raising sheep or Alpacas for wool. We took this video near sunset. The new park is well designed . Our only complaint is that there are only 30 sites. 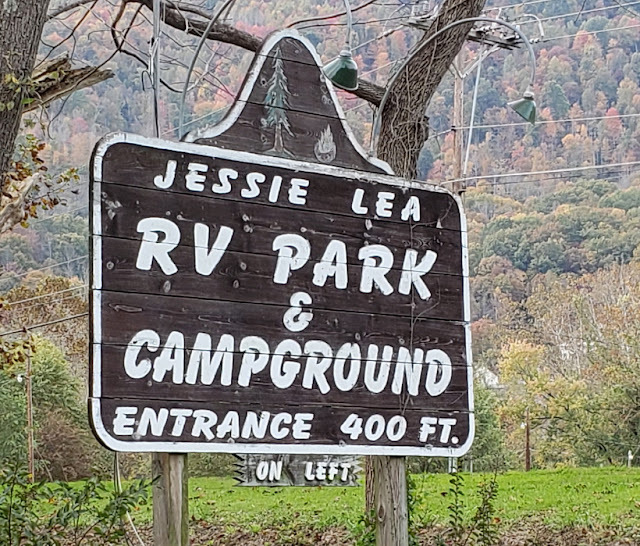 We could only stay one night because the campground was full for the weekend. Even the Day Use Area looks welcoming. The lake access is to your left. From Fort Smith, we head south on Route 71 and 40 to 71 south again towards Gillham. Part of this route takes us right up to the Oklahoma border. Around Fort Smith we cross the Arkansas River. 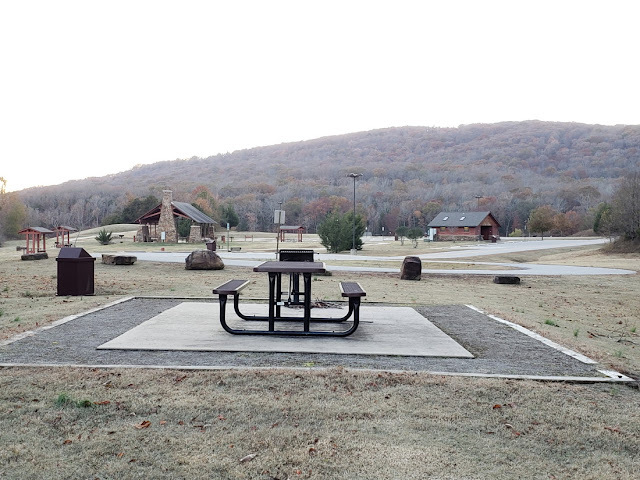 There are many lakes and Corps parks coming south out of the Ouachita Mountains in Southwest Arkansas. 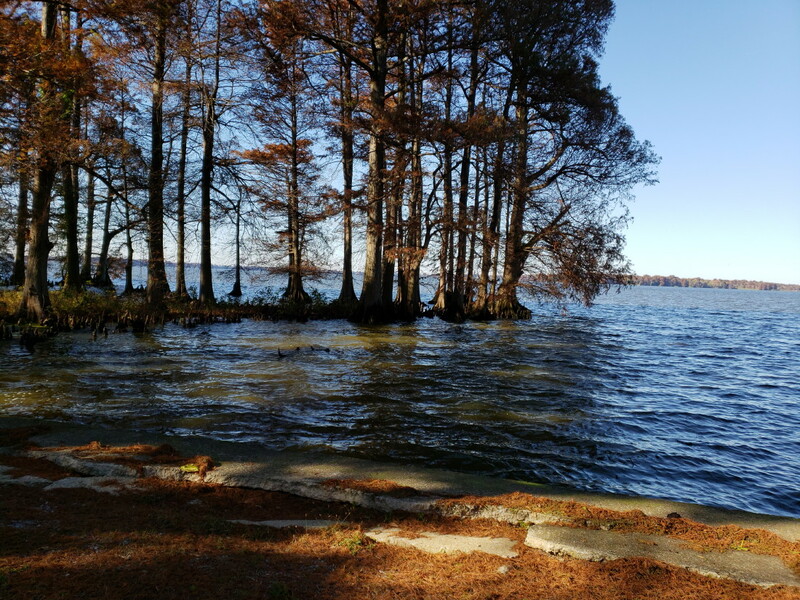 One recommended to us by the gentleman at Old Post was Cossatot Reefs COE on the Cossatot River before Gillham Lake. 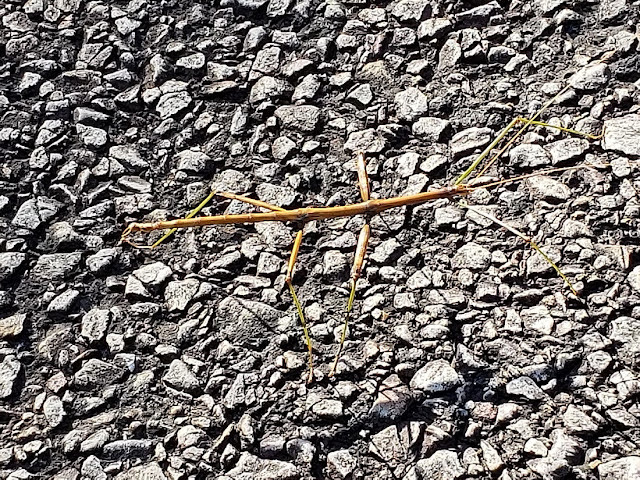 We used to have a number of praying mantis at our old house. Actually, not so many in the last years. Not sure why. 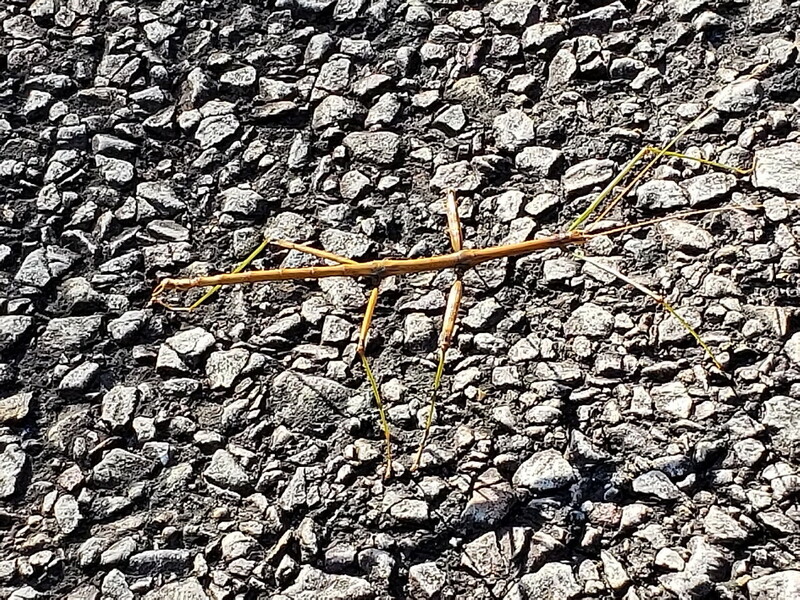 So that was what first came to mind when Jan saw this walking stick on our camp road at Cossatot. Can you imagine how hard they are to find on the forest floor? We barely caught this one because it was contrasted against the pavement. The colors exactly match the twigs on the local pine trees with the right color green for pine needles at the ends. You have to play this video all the way to the end to catch the heroic camera man with " I'm outta here" . Come on Bruce, it's a little insect. Big Pines is right on the Caddo River with inside and outside seating. 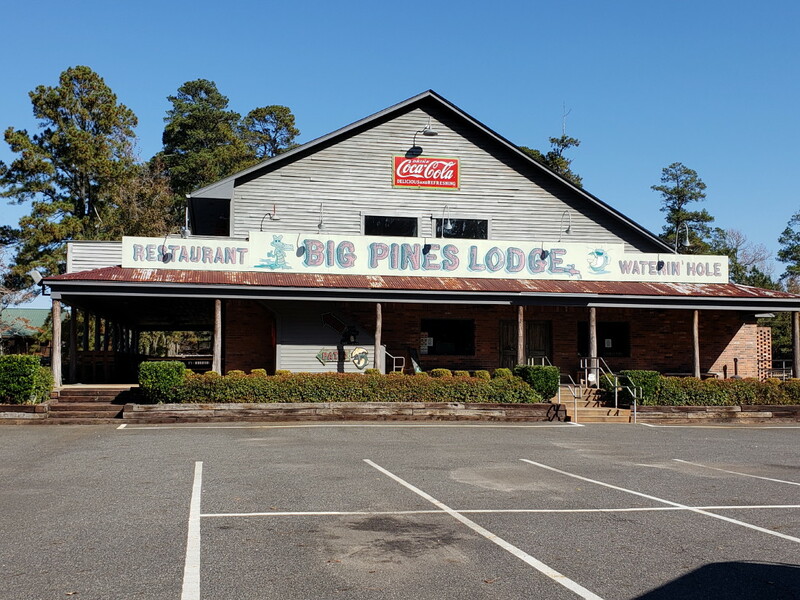 Check out the website and note the menu with Fried alligator, Fried Pickles, and Fried Catfish. Unfortunately, at this time of year, it is only open on weekends. Coming into Texas, we found our favorite COE at Wright Patman in Texarkana was closed for improvements. But we found a new favorite in Clear Springs COE. After that stop, we head south towards Marshall, Texas and an overnight that allows us time to shop for Thanksgiving. 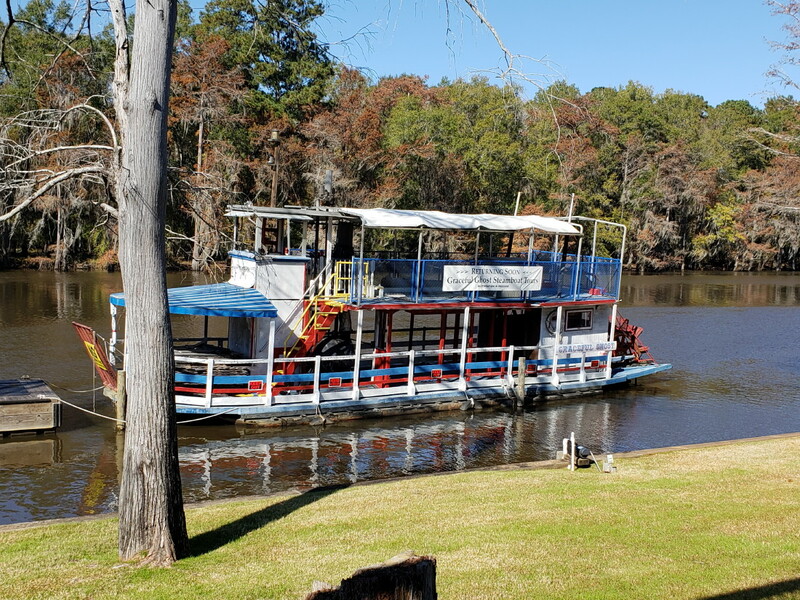 A small park close to Caddo Lake State Park on the river. 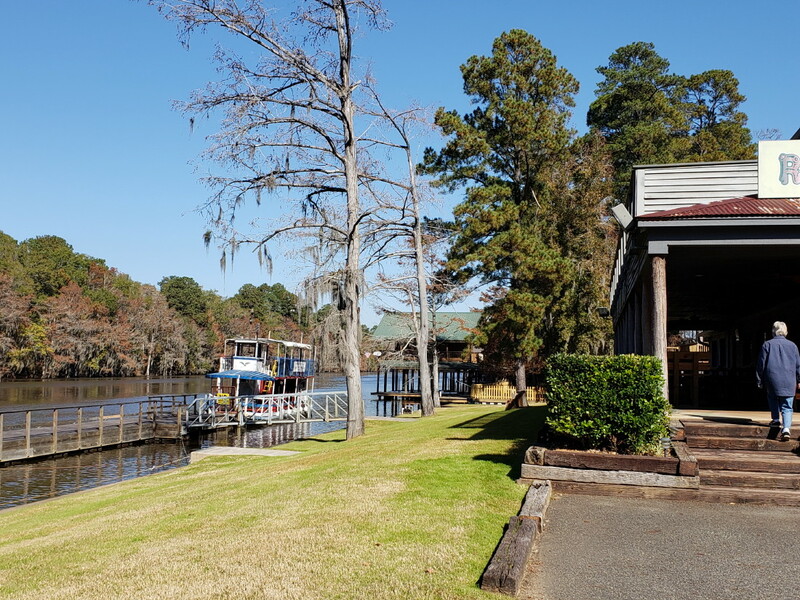 On weekends and summer time, there are boat rides and a great Louisiana style restaurant on the water. 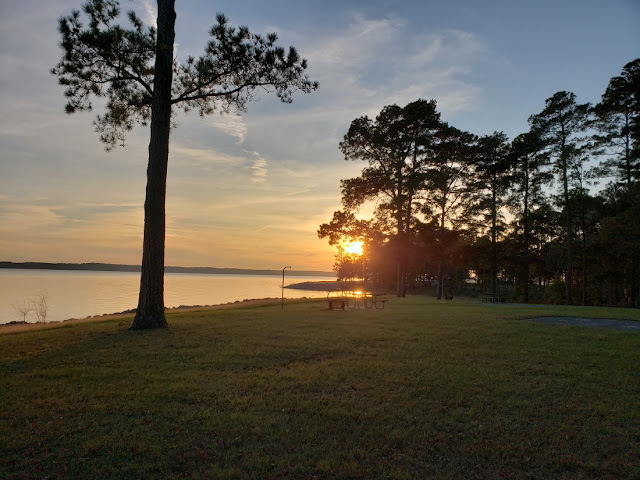 Just in time to Rayburn COE park for Thanksgiving sunset from our site. A little video gives you our backyard and a very small part of the reservoir. The far shoreline is 3 miles away. And ending this with an unusual view of the clouds being split into a small rainbow by the sun over the lake. nice hiking trail past the lake. divided highway. The smudges are from a dirty windshield! A reminder that you can click on the pictures and videos to enlarge. Close to the center of town is the Jessie Lea RV Park. 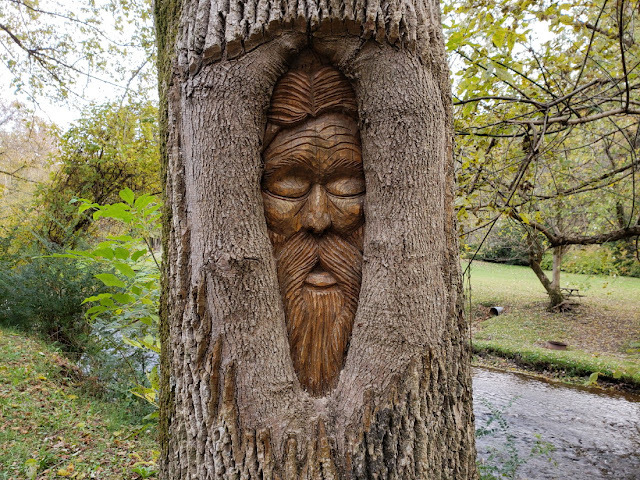 Alongside a small river with a walking path, it is a very pleasant ,friendly park. The owner set up most of the park himself. 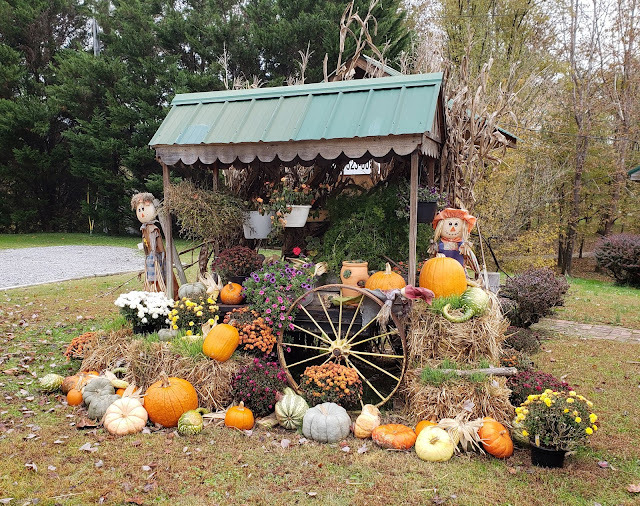 This fall decorated cart is one example. He is also into antiques, old motorcycles(like 1920's and 30's, and more. 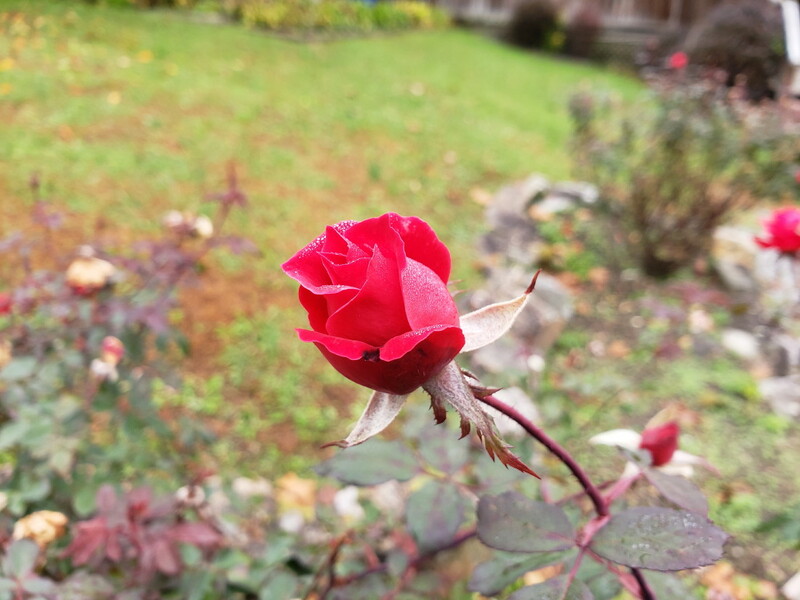 It may be late fall , but the roses are still going. Along the Riverwalk , by the campground, this live tree carving was done by the campground owner. We are still heading south on Route 58 . If you note the 4 lane highway at the bottom, you have some idea of the rolling hills and mountains in the area. We commented a number of times that almost every property is built on a hillside. These houses were on fairly level land. Southwestern Virginia, in farm and mountain country, yet here and there houses like this one. Impressive. Colors were still coming in for the lower elevations. Jan and I are still amazed at the roads in this section of Virginia and also into Kentucky. 4 lane divided highways with little to almost no traffic in places. Look above and weep New Englanders! We are now approaching the Cumberland Gap area. The bison were once plentiful here , even if less so than the plains areas. 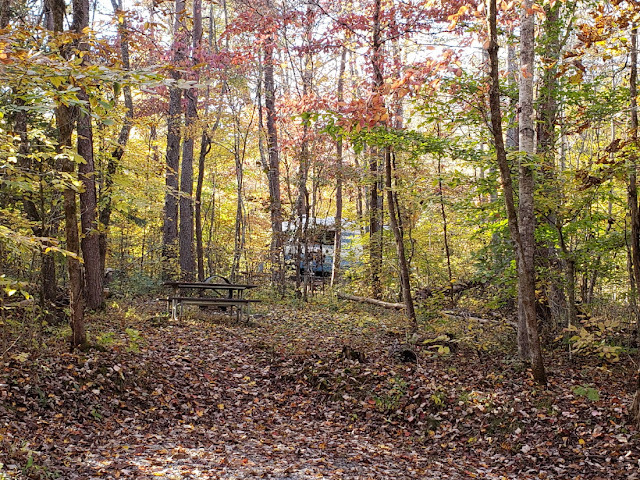 Wilderness Road is the National Historical Park Campground that we very much enjoyed. Having come from the Shenandoah Blue Ridge Mountain area, through the western Virginia valley and then here to the Appalachian Mountains and the Gap, we can appreciate the views of the European settlers. They first stayed east of the Blue Ridge until land became scarce. A while longer to settle the valley beyond. 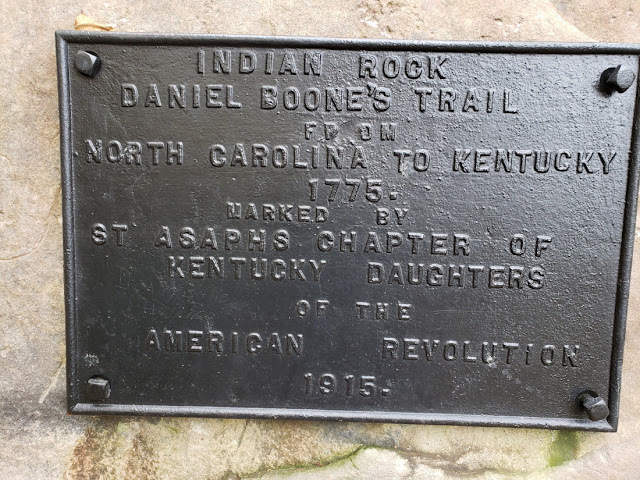 Then Daniel Boone blazed a trail through the gap in 1769. Then in 1775 Boone and others blazed a road through the gap opening the Kentucky wilderness and more to settlers. One of the campground loops offers some great foliage color. Lady Blue is happy in her dry camping spot. Senior Pass made it $10 per night. A number of trails are in the area. Also the Visitor's Center had some wonderful movies about the gap and Daniel Boone. 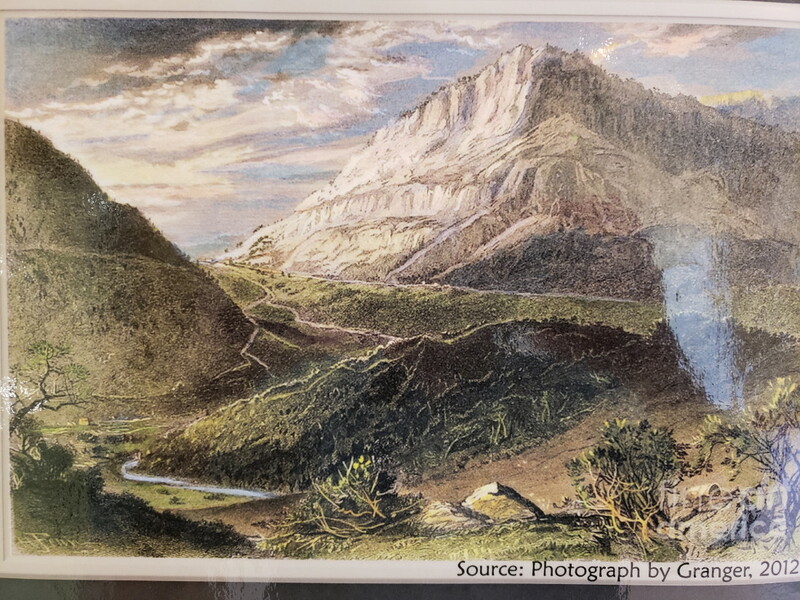 The gap pictured in the photo of a painting above was quite different than the extremely difficult pass through the Rockies that Lewis and Clark found in 1803. 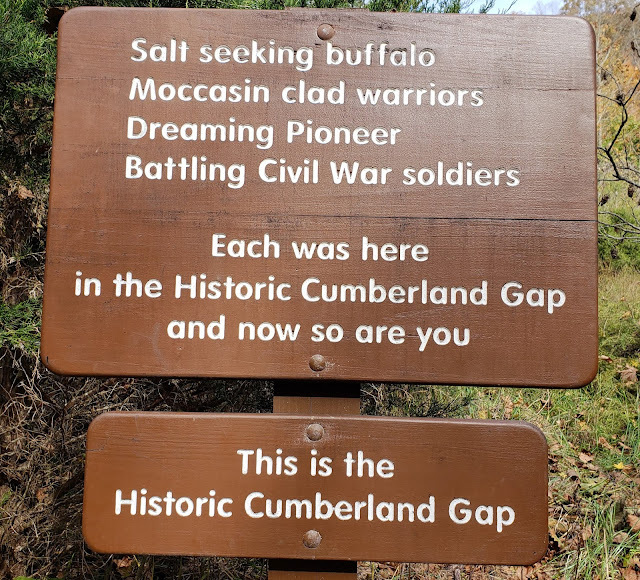 This gap, the only one that was found in the 1700's, was already a bison track to the salt licks beyond. 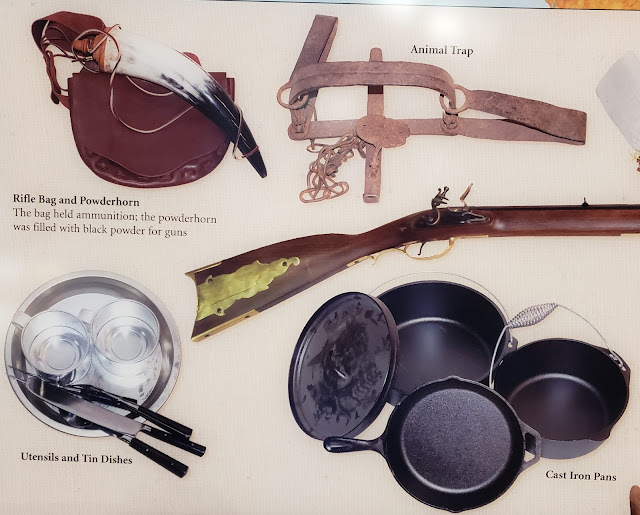 It was also an Indian track for many tribes from the south and north to the bountiful hunting ranges. From 1780 to 1810 200,000 to 300,000 people passed through the gap heading west. 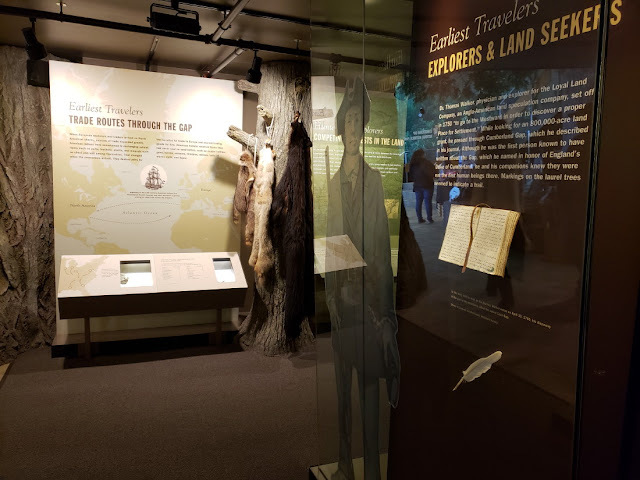 The museum covers a number of topics about the trade routes, the explorers, Daniel Boone, and the conflicts between the Native Americans and the settlers, and also between the Native American tribes. Some mention is also made of the Civil War troops that occupied the land ; both North and South. One thing we noticed from paintings , was how the discovery of coal and other minerals encouraged the stripping of the forests. The mountains in the area became treeless, stark , and uninviting. From 1716, this is a chart of the trading prices for European goods. We could understand the 30 buckskin price for a good rifle, but found the market for a calico petticoat at 12 buckskins a little surprising. 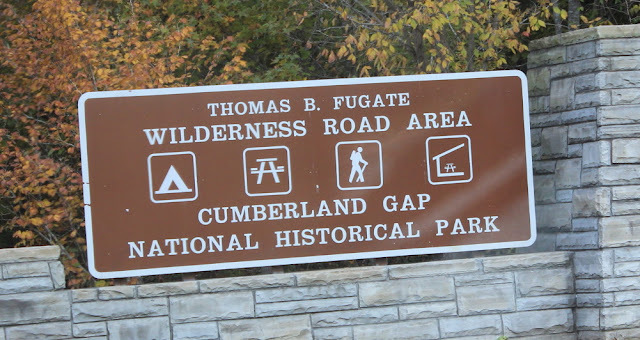 The Wilderness Road and Cumberland Gap are at the intersection of Southwest Virginia, Tennessee, and Kentucky. 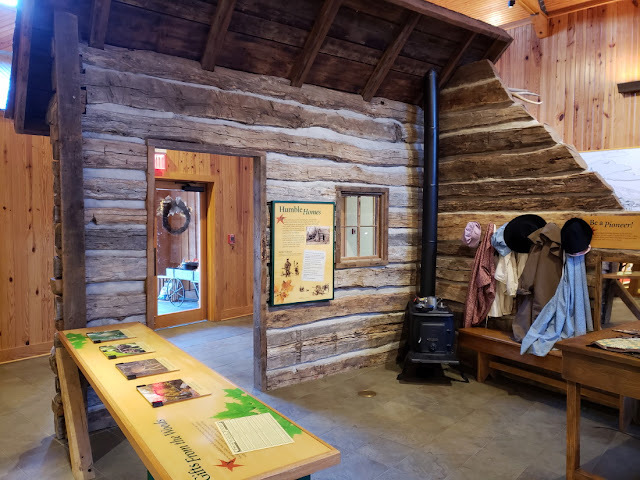 Even in many small towns there are buildings saved or recreated in the frontier log cabin style Images for typical Daniel Boone style log cabins . Also enjoy seeing the Kentucky style split rail fences. 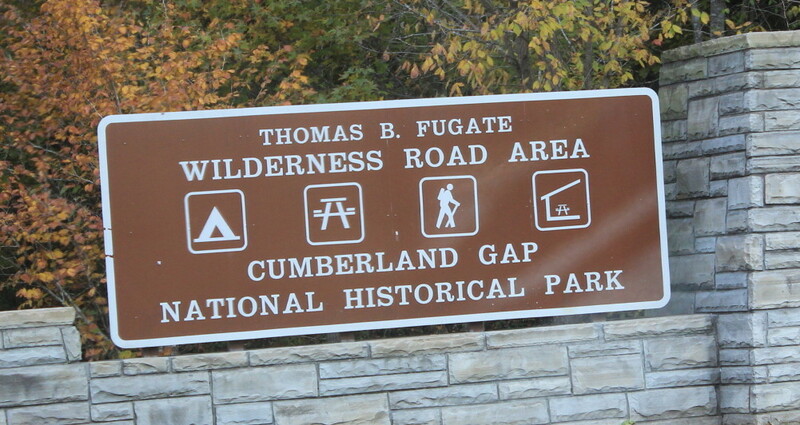 We did a hike from the Visitor's Center road up to the gap on the Wilderness Road Trail. 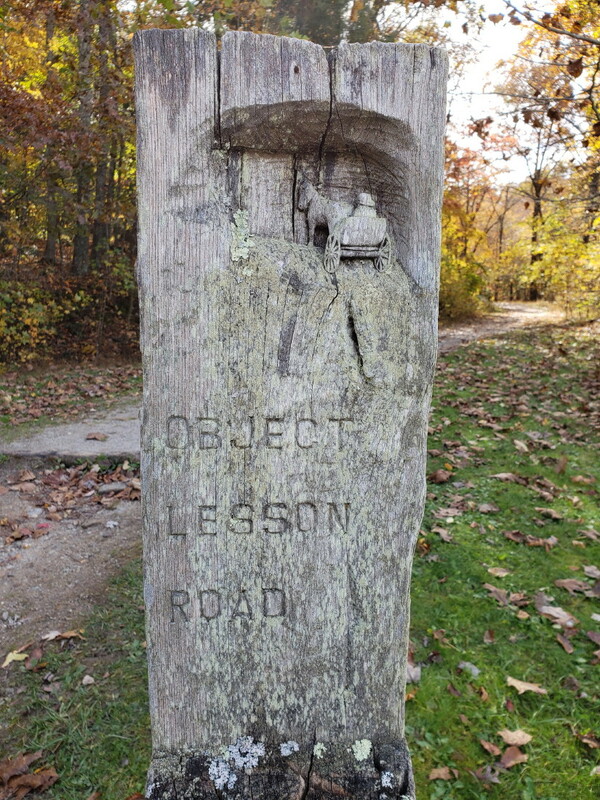 No real views from there, but a nice hike and trail markers like this one for Object Lesson Road. Early engineers made a road on this section on the trail to demonstrate 1800's road construction that could last and avoid erosion. 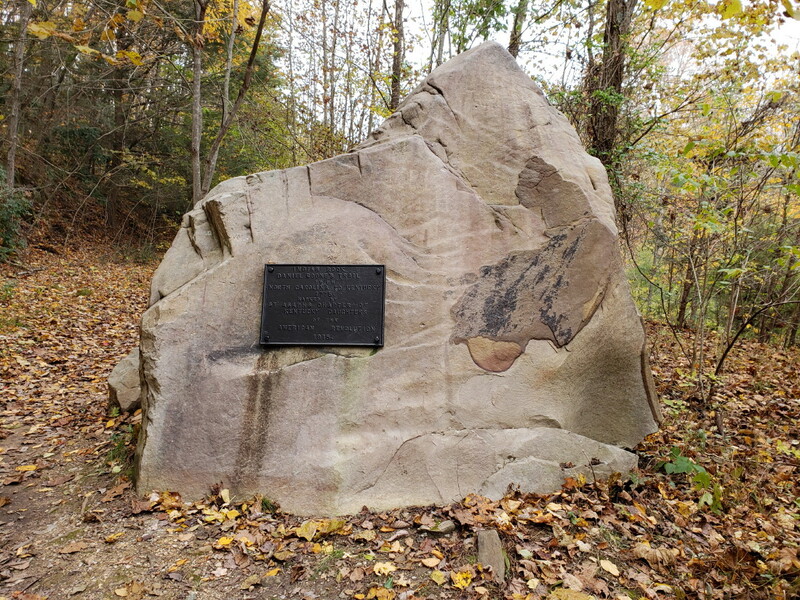 Other markers like this one on the boulder seen below. Sometimes it is nice to stop on a trail and know that you are standing in a spot occupied by so many from previous years. Easier to imagine some of what they were seeing and thinking at that time. As hard as it can be in a modern, busy city, you can even do this following the Freedom Trail in Boston . 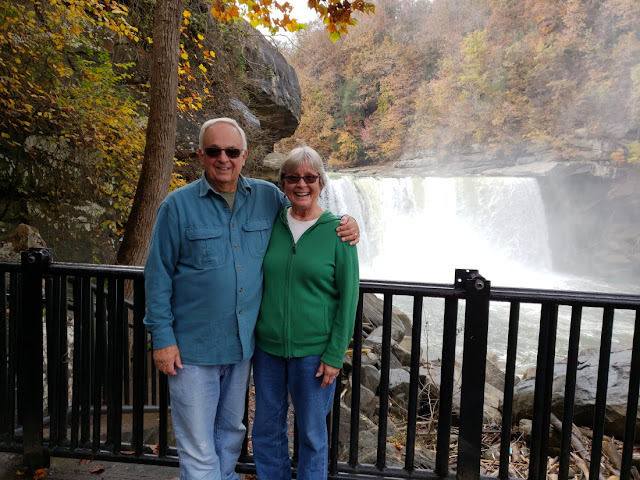 From the Cumberland Gap, we follow route 25E up to Corbin and south on 25W to Cumberland Falls State park on the Cumberland River. These falls are the largest falls east of the Mississippi and south of Niagara Falls. Once you click on the arrow button to play the video, most computers will allow you to click in the lower right square to enlarge the video to full screen. Cumberland Falls State park was on Route 90 and so we continue west on Route 90 which follows the Cumberland River. Sharp curves and some steep sections. Once we begin to head north with Route 27 the land begins to level out to the wonderful Kentucky farm land. Soon we are coming in towards Lake Cumberland. 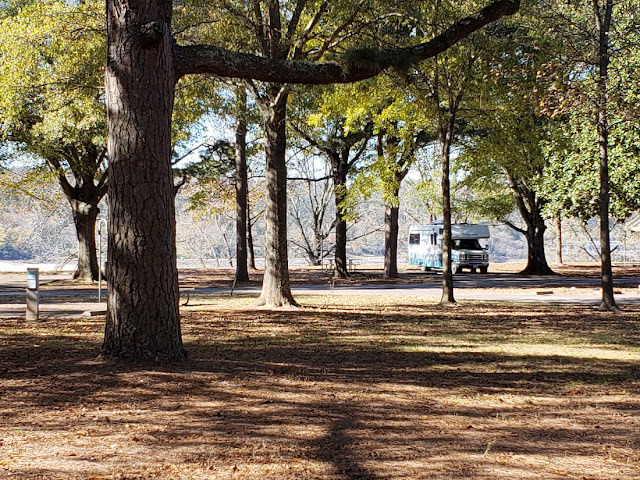 Here we stay at one of our favorites, Kendall COE Campground. 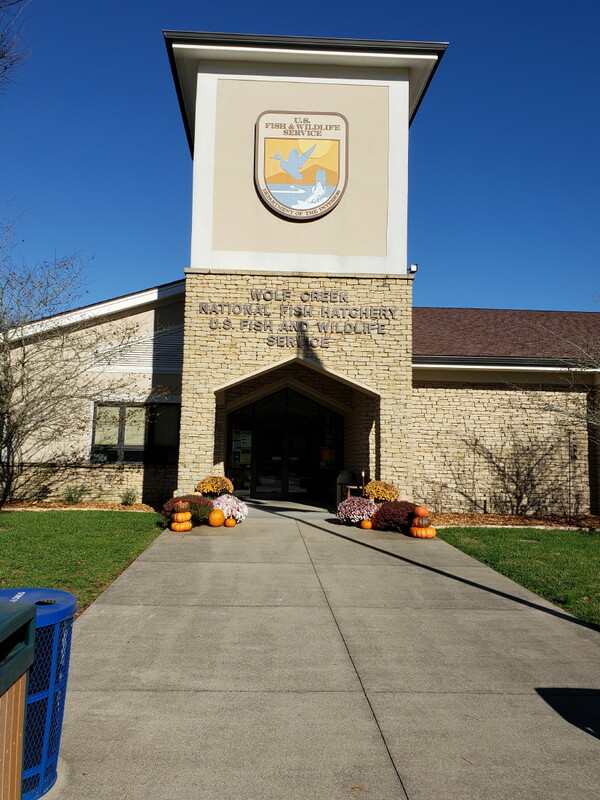 Right next door is the Wolf Creek National Fish Hatchery. 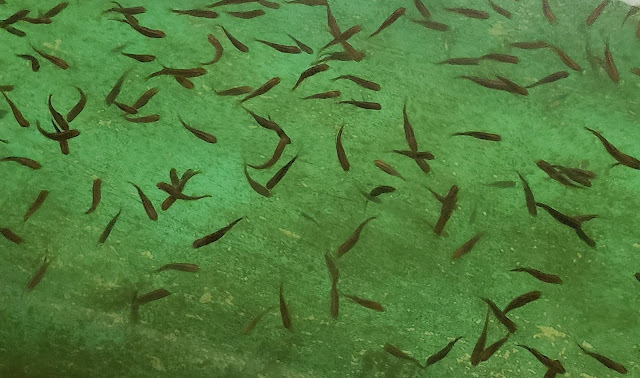 Inside are long , long concrete fish tanks filled with fingerling trout. The water constantly moves and thousands of tiny fish are all over the place. Outside are more concrete fish tanks covered above by netting--to foil predator birds from easy meals. These fish are much larger to almost fully grown when they are sucked into large trucks to bring to ponds and lakes and rivers in Kentucky and released. It seems that most fish here are Rainbow Trout.